I think the unifying theme for every person in their 20's, regardless of race, religion, or sexual orientation, is that none of us really has a clue what we're doing. Cole, the main character of Paper Boys, is no exception to this rule. He's trying to figure out how to land a job he loves (that will also pay the rent in one of the most expensive cities in the world), what to say to his straight best friend Daren who recently confessed he doesn't want to marry his fiancée, and why he can't seem to stop himself from stalking an old flame, Max, on Facebook. If all of this wasn't enough to worry about already, Cole has also discovered that his sketchbook is, well... enchanted. Whatever Cole draws seems to happen in real life, and while this newfound power could be the answer to all his problems, he hasn't quite figured out if it's only going to make his life even more complicated. Written by Curtis Casella and Kyle Cabral (Cabral also directs the series and stars as Cole), Paper Boys is a delightful new web series that takes the sometimes harsh reality of being a confused millennial trying to juggle love, a career, and a new city, and spices it up with a bit of magic to make it all the more captivating. The first two episodes have already generated over 90,000 views on YouTube, and the creators have recently succeeded in raising $10,500 via their Kickstarter campaign to create two more full episodes (and are hoping to raise even more to keep the series going). Henry: That, for the most part, as fantastical as the notebook element may be, we are showcasing real people who are struggling with the same issues that we all deal with. They're asking themselves the same questions we all ask ourselves, while trying to figure out where they fit in the world. Kai: I hope that viewers will notice how diverse we are. The main character is Asian and the sisters are Asian and white. This dynamic is occurring more and more in the world we live in but the media tends to show only homogenous families. I hope we're helping to create a new normal. Curtis: When we set out to create Paper Boys, we didn't want to write something that was the same as other shows and web series with gay characters in them, and we ultimately decided on adding in this element of fantasy. We thought the sketchbook was appropriate because it gives Cole a degree of control over his life, which I think many of us millennials don't always feel we have, especially after the financial crisis. So we wanted to explore questions like whether Cole is better off? Will he be happier? 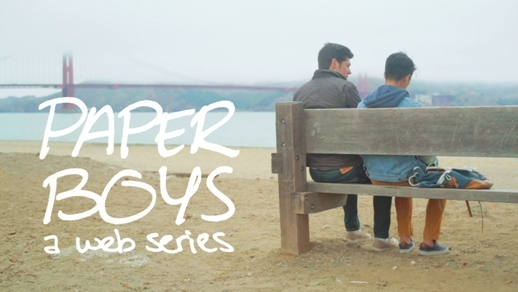 A lot of people describe Paper Boys as a "gay web series" -- this seems to happen a lot when a creator features a minority as a main character; the project becomes niche rather than general, it becomes a "gay web series" rather than just a "web series." What does Paper Boys do to transcend that label and appeal to the masses? Curtis: One of the reasons we created the sketchbook was that a lot of gay media is very rooted in reality - Looking, Weekend - and we wanted to tell a story that wasn't just about being gay, but about a gay character making the discovery that he has this power. Kyle: We'll also have more diversity and representation moving forward, so I hope our series does a good job of being inclusive and relatable. I think the mere fact that we have characters that are involved in such complicated relationships - in terms of family, friends, and love - is something that anyone and everyone can relate to regardless of gender, race, age, or sexual orientation. Once you realized you possessed a magic notebook that made things happen in real life, what would be the first thing you'd draw? Kyle: I can't decide between drawing myself as a new mutant member of the X-Men, or sitting in the master suite office of my very own film and animation production studio. Both are practical, I think. Nathan: ...there are too many things I'd want from comic books to say. Head over to Paper Boy's official website to get caught up on the series, and make sure to "like" their Facebook page for updates on new episodes!